Sensetek offers pressure sensor and Melt pressure sensor with excellent Stability and accuracy. This sensors comes with all stainless steel sealed construction, corrosion-resistance, various configuration of O/P, Wide temperature compensation, signal output and double output, zero and span adjustable, with OEM model optional. Available in 0 – 200, 300, 450, 500, 600 and up to 2000* bar to combined accuracy of 0.25%FS, output signal 4~20mA 0~10V and Input 24V (12~36V) DC input, overload pressure 150% FS Excitation, operating temperature 40 degree C ~ 125 degree C and 450 degree C for melt pressure sensor, Thread Mounting. Our Products are Rotary Encoders, Magnetic Rotary Incremental / Absolute Encoders, Optical Rotary Incremental Position Encoders. Ceramic infrared heating elements are efficient, robust heaters which provide long wave infrared radiation. They are used in a diverse range of industrial processes such as thermoforming, paint curing, printing and drying. They are also used very effectively in infrared outdoor heaters and infrared saunas. Quartz infrared heating Elements provide medium wave infrared radiation. They are favoured in industrial applications where rapid heater response is necessary, including systems with long heater off cycles. Ceramicx Ireland produces extremely penetrative infrared emitters using two types of tungsten filaments: the porcupine or star type filament for fast medium wave emitters, and the supported filament for short wave halogen emitters. In these custom built infrared heaters, the heating coils are embedded in a special ceramic fibre-board which insulates, adds durability and shock resistance. They are a neat, easily mounted and readily expanded heating solution. Ceramicx Ireland Ltd. has the ability to manufacture powder pressed precision components for reliable and trouble-free use in high temperature applications. ELMEC is one of the leading heater manufacturer in India established by Mr G.Srinivasan in the year of 1973 Elmec design and manufacture Ceramic band heaters, Mica band heaters, Nozzle heaters, High density Cartridge heaters, Split type cartridge heaters, Low density cartridge heaters, Tubular heaters, Manifold heaters and Hot runner nozzle heaters, Micro coil heaters, Hot runner controllers, Leaf proof nozzle heaters, High Watt nozzle heaters. Elmec is also authorized distributor for Opkon, Maxthermo, Ceramicx, and Optris for the Products of Linear sensor, Linear Encoder, Rotary encoders, Pressure sensor, Melt pressure sensor, Temperature controllers, Infrared heaters, Infrared thermometers and thermal imaging systems and hot runner systems. With over 37 years of experience in the field of Heaters, sensors and controller, Our Company had gained enough knowledge to assist our customers to select suitable solution for their demands. We design and manufacture standard and tailor made Ceramic Band, Mica Band, Cartridge, Tubular, Hot Runner, Micro coil, Manifold, Hot Runner Controller heaters, heating Equipments and thermocouple. These heaters are installed by careful hammering on the heaters along with square section grove over the manifold and pressed to hold the heaters in position and to get good surface contact, which results in good thermal exchange and increases the heater life and reduces energy loss. Any product that we Manufacture are deal with, we assure the quality and standard on it. We have improved and become more energy efficient. There are now many types available, including solar-powered, natural gas, propane and electric. Infrared Heaters are also very energy efficient, because none of the heat that they produce is wasted. They heat the surrounding area by emitting thermal energy waves that are absorbed by the materials around it. Infrared Heaters are also great at spot heating certain areas that you and your family spend most of your time in. The oil filled heater is a very effective heating unit. Its technology has been around a long time and has proven itself. The unit itself is basically a radiator that is filled with specially made oil that conducts heat. Also inside the unit is a heating element or coil that heats the oil to the desired temperature. All our heaters are tested for High voltage test up to 2000 Volts and merger 100 Meg ohms to infinity. Highly compressed Tubular heaters are the most advanced heating solution for injection manifolds. 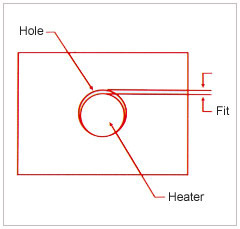 The square section tubular heater allows excellent heat exchange between the surfaces of heater and manifold. For more detail about Elmec Heaters please visit our website: http://www.elmec.in. Manufacturer of heater in India, to make awareness to express the needs and the usage of heaters globally. Even with all these features Elmec offers high wattage in a smaller package at a comparable price to conventional heaters.